This small wooden artefact was discovered during the National Museum of Ireland’s excavations at Fishamble Street in Dublin. These extensive works revealed a wealth of information about the Viking Age city and the people who lived there between the 9th and 11th centuries AD. 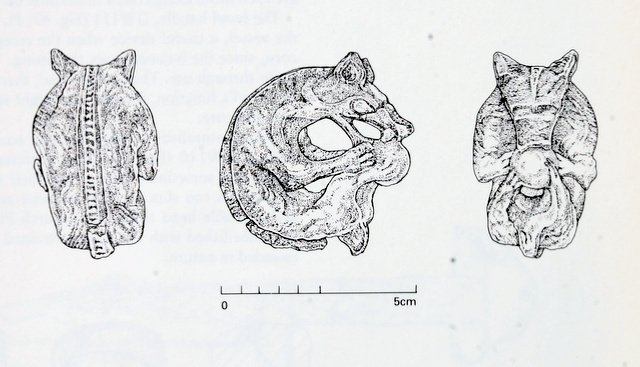 Measuring circa 5 cm in diameter and carved from a single piece of wood, the artefact appears to depict a wolf-like animal clasping a ball between its jaws and paws. The back of the beast is curved and contains a raised ridge, which is reminiscent of a boar. However, the rest of the animal is distinctly canine-looking. It has raised and pointed ears, tear-drop shaped eyes, distinct paw pads and prominent fangs which clasp the ball. A gap exists between the upper paws and the neck of the animal, allowing a string to be threaded through, which suggests that it may have been worn as a pendant[i]. 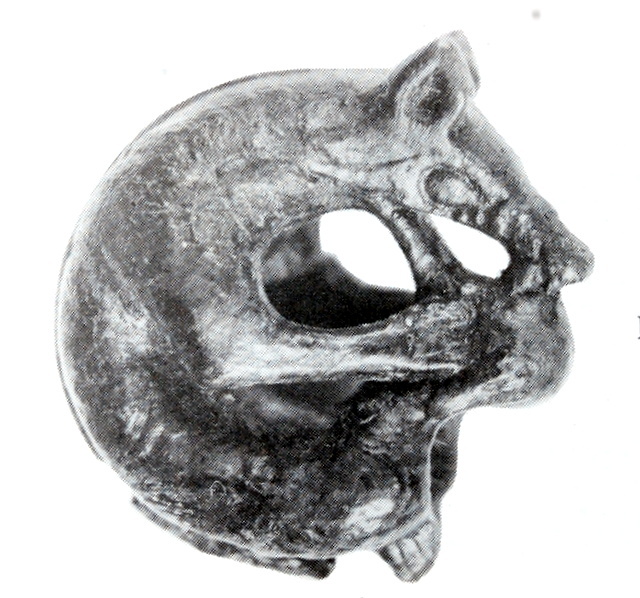 Although this depiction of a dog-like animal may merely be a decorative devise, it could also reflect Norse mythology, where the Viking wolf Fenrir features prominently. According to Eddic poetry this fierce beast is destined to battle Odin during Ragnarök, the Viking end of days. After defeating Odin, Fenrir will leap into the air and swallow the sun, bringing darkness to the world (some versions suggest that his son, Skoll the wolf, will swallow the sun instead). This may be what is being depicted in the Fishamble Street piece: an enormous wolf devouring a ball-like sun. If this is the case then the object may represents a pagan amulet. 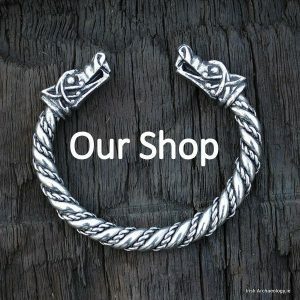 That such an artefact would be found in Viking Dublin is not surprising as the city remained ostensibly pagan until the early 11th century when its king, Sitric Silkbeard, formally established the diocese of Dublin and Dúnán was ordained the city’s first bishop. The word ‘possible’ is crucial here. 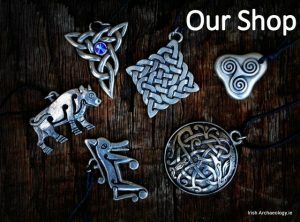 We should always stay cautious ‘addressing’ Viking Age artefacts to a Norse mythology creature this or Norse God that.. The smith/caster did not leave his portfolio, and the the true depiction (if it isn’t zoomorphic at all and not to be addressed as an animal this or that) in fact is hidden in the maker’s grave. For myself, not knowing everything is the charm of this dark Viking Age. Linzi Simpson directed one of the sites on Fishamble St/Essex Street West, (beside Handels Hotel), which I had the pleasure of working on….and I’m certain she published all relevant material, under Margaret Gowan & Co Archaeologists. At certain angles the longer hairs on a wolf’s back often look like a spine or ridge, especially if the animal is angered. That could be one source for the stylised ridge on the figure I suppose. Fascinating artefact. Has the origin of the wood been analysed, Irish-made or from overseas? More impressive is a piece of wood have been preserved for nearly a thousand years . What would be the type ??? I just want to say, without a doubt, this is the GREATEST web site!!! I am Irish second generation in America. You give me so much that I crave about my history. What can I say: wonderful! Of course it is Fenrir the wolf eating the sun! The only other option is his brother who is expected to swallow the sun at the end of time. Why are archaeologists so eager to call an unidentified artifact a “religious item,” yet so hesitant to identify an obvious religious item by its obvious name? They are pseudo-intellectual cowards, that’s why. PS. i hold two degrees in History and another in Anthropology with a minor in archaeology and 3 years of experience working in an archaeology lab. My specialty is the Viking Age and the tribal societies of Northern Europe. So, I know what I am talking about here.